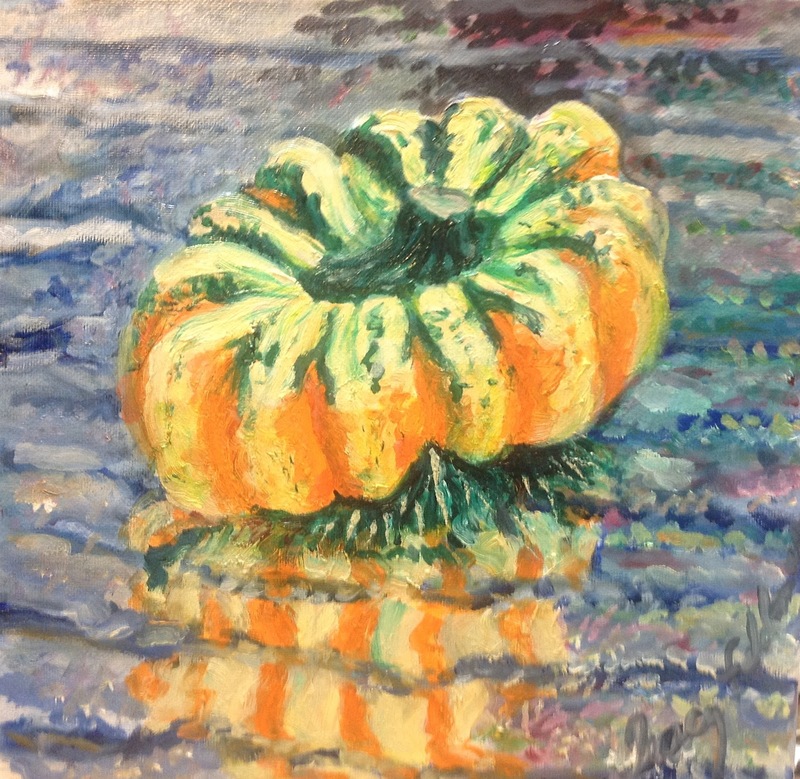 Green Acorn Squash, oil on canvas, 8 x 10"
Circus Acorn Squash, oil on canvas, 12 x 12 "
Last week I talked about starting a 3 painting series when I painted some acorn squash that I bought at our local Amish farm stand. What drew me to the subjects were the circus colored acorn squash. I initially painted Awash in Fall Produce multicolored acorn squash in 17 x 7" format, along with some cute little peppers. As I had been doing for a while, that piece was created in watercolor on canvas; but I decided to go back to painting in oil for the other two pieces to see how that changed my painting experience. What I found is this. There is a learning curve that takes place when I go between media -- even if I am very familiar with the "new" medium. 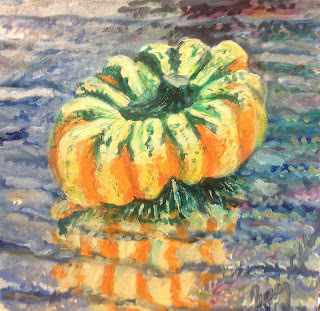 Circus Acorn Squash was my first attempt to go back to using oils to create my little painting of this squash. Although the canvas size I used, 12" square should have made it easier to paint, it wasn't. In fact, I took several days to get an effect that I liked pretty well. I was unhappy enough with the painting at the end of my painting session, I may have left the piece unfinished. But, then the voice of Andy Smith, a wonderful watercolor artist with whom I've studied in the past, came to mind. In each class he would routinely share with someone who was very frustrated, "All paintings go through an ugly stage. Keep going and keep focused and it will get better." I am so glad that I chose to follow his advice and return to the painting the next day. Not only had the surface got less oily -- so it was easier to continue painting, but the time distance helped me focus better on the moment and rescue it. "Thanks, Andy!" Green Acorn Squash, on the other hand flowed much more quickly on to the canvas as I painted. I remembered another painting teacher, Scott Wright, advised me to glaze the surface with a 50/50 combo of Gamsol and Galcid (an odorless mineral spirit and a painting medium made by Gamblin), so the surface was much more welcoming of the paint. I also allowed myself to work in a much more limited pallet, so the beauty of the shape shone through much more easily. In fact, the piece came together in a small fraction of the time of either of the other squash pieces. 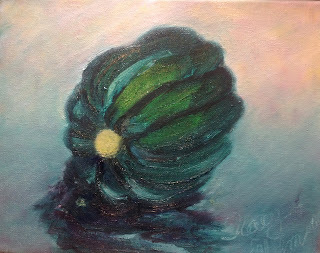 If you notice, I used an 8 x 10" canvas when painting this Green Acorn Squash, and that is different from the shape of the other two pieces in the series (Awash in Fall Produce and Circus Acorn Squash). I did that because I thought their size differences would create an interesting visual relationship between them. I hope you enjoy. I hope you enjoy both. Like Awash in Fall Produce, these two paintings will be offered in Auction on Daily Paintworks.commy gallery @ Daily Paintworks. I'll put them up for 2 weeks and then withdraw them if they don't sell by then because I want them available for my show, At Home & Abroad: recent paintings by Tracy Feldman, that will be at the Pemberley Tea Shop and Gallery in Lancaster PA.